Alan Byrne scores for Portadown against Carrick Rangers. 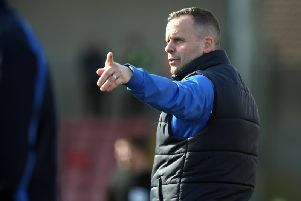 Pic by PressEye Ltd.
Carrick Rangers manager Kieran Harding entered Saturday’s road trip in search of a league lift off the back of midweek cup success. However, a performance in which the Carrick boss considered his players “second-best to everything from start to finish” instead resulted in significant cause for concern. Harding struggled to come up with answers below the Shamrock Park stand for a display that marked a low since his summer arrival as manager. “We had been poor in the league game with Ballymena United but did enough on the night against a tough Ballyclare Comrades to get a 2-0 League Cup win,” said Harding. “There was nothing to tell me to expect that (Saturday) was coming and it was as poor as we’ve been this season. “A result at this point in the season will obviously not decide anything but it was still a big one for us and the players did not seem to realise the enormity of the game. “We need to get it sorted out quickly otherwise we will find ourselves in real trouble. “We never started the game and never made our challenges, with the application and work-rate poor. “Consistency will always be difficult with a new squad just put together over the summer while players adjust. “However, there was no hunger, no enthusiasm against Portadown. CARRICK RANGERS: Ryan Morell, TJ Murray, Chris Morrow, Steven McCullough, Paddy McNally, Nathan Hanley, Tiarnan McNicholl, Adam Salley, Gareth McKeown, Mark Surgenor, Brian McCaul. Subs: Miguel Chines (McCaul, 54), Fra Rice (Morrow, 73), Glenn Taggart, Gary Lavery (Hanley, 64), Conor McFall.